2010 Harmony Sweeps Los Angeles Regional Winner SoundStage is a talented mixed voice (4 men, 2 women) Contemporary a cappella sextet who drew a huge ovation with great harmonies and lead at the recent Sweeps Finals in San Rafael. "In House" has 15 excellent covers of Pop, Rock, Show, Jazz and Soul tunes, all arranged by group member Bradley Hampton. Some favorites are the Spencer Davis Group hit "Gimme Some Lovin'," Lennon/McCartney's "Good Day Sunshine," a jazzy rendition of the classic "Route 66," Harold Arlen's "Over the Rainbow," Slocum's "Kiss Me," and a pair of originals, Hampton's "On Your Way Back Home" and (with group member Kyle Bowen) "Everybody Needs Some Love." Other favorites are Aretha Franklin's R&B anthem "Respect," Yancy/Jackson's "This Will Be (an Everlasting Love)" and McNaughton's "Love at Home." 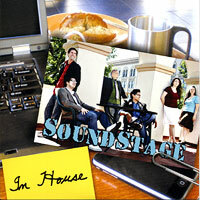 SoundStage's live show is as dynamic and exciting as they come, and "In House" is an impressive, finely-crafted debut CD. We loved it, and are expecting big things from fast-rising SoundStage!